Produced by: Florenz Ziegfeld, Jr.
“Show Boat” was a testament to the courage of composer Jerome Kern, lyricist and librettist Oscar Hammerstein II, and producer Florenz Ziegfeld. In an era of “willful nonsense,” they attempted a complicated musical narrative epic with challenging themes and many storylines. It was the first time that serious black and white characters held the stage together as equals. Cap’n Andy’s show boat, the COTTON BLOSSOM, travels up and down the Mississippi for decades, folding in its wake his brittle wife and glowing daughter, Magnolia, and her doomed romance with a gambler husband, along with a troupe of complicated supporting characters. Among them is Julie, a performer on the boat whose mulatto roots are revealed; because marrying a white man is against the law, she is forced to leave the COTTON BLOSSOM and spirals downward in an alcoholic fog. Her story intertwines with the romance of Magnolia and her ne’er-do-well husband as they are separated and united over several decades. Yet the most important character of all wasn’t even on stage. “Ol’ Man River” was a serious song, about the destiny of the mighty Mississippi and the people it encompasses. 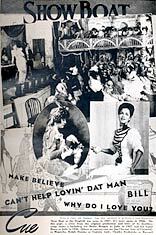 When it docked at the stunning new Ziegfeld Theater, the show gave audiences the same values Ziegfeld had offered for two decades: a huge cast, comic songs and dances, black actors performing with white actors, breathtaking design, soaring music, overwhelming spectacle, all burnished to a golden sheen. But this time, it had a story, an American story, a story with heart. “Show Boat” was an out-and-out hit, running 572 performances and proved so beloved by audiences and so lucrative for Ziegfeld that he revived it as early as 1932. It has been revived half a dozen times since and filmed three times.